The Suncook Valley Area Lions Club (serving Pittsfield and Barnstead) is collecting gently used items for the Town Wide Yard Sale. Spots are available (for $10) for other groups or individuals to set up with the Lions Club at Northeast Earth Mechanics on Barnstead Rd. If you have any items you’d like to donate or for more information, please contact Laurie Vien at 435-5052. The Center Barnstead Christian Church is hosting a really big, super fun event on Wednesday, May 16th for kids, parents, teens, adults, friends, and family! First, from 5:30 to 6:30 pm we will feast on a spaghetti dinner for one and all. Be sure to join us for another satisfying and delicious meal. Immediately afterwards, at 6:30 pm, we will be treated to special performances by “Manifest,” a team of college students from New Brunswick Bible Institute. This traveling ministry team will perform skits with messages to reach every audience member, both young and old. Have teens living at home? Need some special encouragement? Everyone who attends will hear something just for them, no matter which generation you’re in. For some of you, you’ll realize that the leader of the Manifest Team is even a Barnstead native. 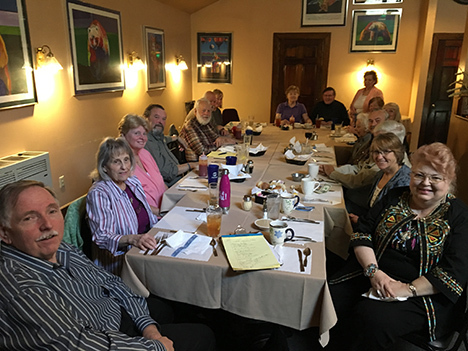 Recently the Locke Lake Social Club held their annual Spring Luncheon at Domenic’s restaurant. Socializing over lunch the club welcomed back the ‘snowbirds’ and friends. Almost 20 members attended. The regular meetings are held on the Colony Lodge on the Second Tuesday of the month at 9:30a.m. for social and the business meeting is at 10:00a.m. After the meeting those staying will have their lunch and play cards. The Club is open to all members of Locke Lake Colony. The next event is our Pizza Party for the members sponsored by the club at high Noon in the lodge. After lunch we shall have ‘Table Horse Racing’ a real fun game. Join us at the library on Friday, May 11th at 6:00pm for a free night at the movies! We will be showing “Peter Rabbit” (PG) and providing popcorn. Pajamas and cuddling items are always welcome. On May 17th at 6:00pm, local resident Lynn Varney will be leading a workshop at the library on how to paint decorative rocks. They can make a lovely addition to your home or garden, as well as gifts for loved ones. Pre-registration is required. Register online at oscarfoss.org or by calling 603-269-3900. Free and open to the public, Central New Hampshire VNA & Hospice invites you to Understanding Your Medicare Benefits on May 16th at the Alton Senior Center, 7 Pearson Road, Alton. The presentation will last approximately one hour, 10:00 – 11:00 a.m., with time for questions and answers. Medicare is a huge and daunting prospect, but help Central VNA is here to help. For instance, a common misconception is that Medicare is only for people 65 and older. But in fact, some younger folk qualify as well, particularly people with disabilities or with end stage renal failure. Do you have to be retired to receive these benefits? Does it cover hospital stays or doctor visits? What is a Medicare Advantage Plan? What are Part A and Part B? What do I need to protect myself? You can learn the answers to these and other questions from their highly qualified staff. Tammi Mozier, MBA, PT, ATC, COS-C and Homecare Clinical Director and Maria Babineau, MSW, Social Work Program Manager, will present and then be on hand to help you understand where you stand, what your future can look like, and how to best plan for that day. Central New Hampshire VNA & Hospice knows that people are happier, and do better, at home. They can help you stay there. Birth to bereavement, they have served Lakes Region communities since 1918. Central New Hampshire VNA & Hospice is a not-for-profit, Medicare-certified provider and is licensed by the State of New Hampshire. The agency is governed by a volunteer Board of Trustees from both the Wolfeboro and Laconia regions and is supported by private and corporate donations. www.centralvna.org. The following students in Grades 4-8 at the Barnstead Elementary School have earned High Honors or Honors for the Second Trimester. Students who have received A’s in all of their subjects qualify for High Honors. Those students who have earned A’s and B’s in all of their subjects qualify for Honors. In addition, students qualifying for High Honors and Honors must have received grades in effort and conduct that are average or above.